Definition: Phonetics is the study of human speech sounds. 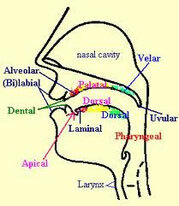 Articulatory phonetics: The study of how speech sounds are produced by the human vocal apparatus. Acoustic phonetics: The study of the sound waves made by the human vocal organs for communication. Auditory phonetics: The study of how speech sounds are perceived by the ear, auditory nerve, and brain.